Republic day 2019 in India is being celebrated on 26th of January, at Saturday. In 2019, India is celebrating its 70th Republic Day. First Republic Day of India was celebrated in 1950. The Beating Retreat 2019 ceremony was held on 29th January at Vijay Chowk, New Delhi. It officially marked the end of the Republic Day celebrations for 2019. Beating the Retreat ceremony this year also followed the age old tradition where the bands of the Indian Armed Forces played various hymns in front of the President of India and other dignitaries. The ceremony was started after the arrival of the President of India, Sri Ram Nath Kovind. The ceremony also saw the presence of Prime Minister Narendra Modi, Vice President Venkaiah Naidu and other dignitaries. The soulful performances by the bands of the Armed Forces in colourful and attractive attire stole the show. This year, around 25 tunes were played in the ceremony composed by the Indian musicians. The hymns majorly included Namaste India, Mushkoh Valley, Indian Soldiers, and Great Marshal along with other traditional tunes. The ceremony was mainly conducted by Cdr Vijay D’Cruz whereas Army band was conducted by Subedar Parwinder Singh. Master Chief Petty Officer Vincent Johnson and Junior Warrant Officer Ashok Kumar conducted the Navy and Air Force band respectively. The culmination of the Republic Day celebration was finally followed by illuminating of the Rashtrapati Bhawan, Central Secretariat and other governmental building with colourful lighting which brought the official closing of India’s 70th Republic Day celebrations. 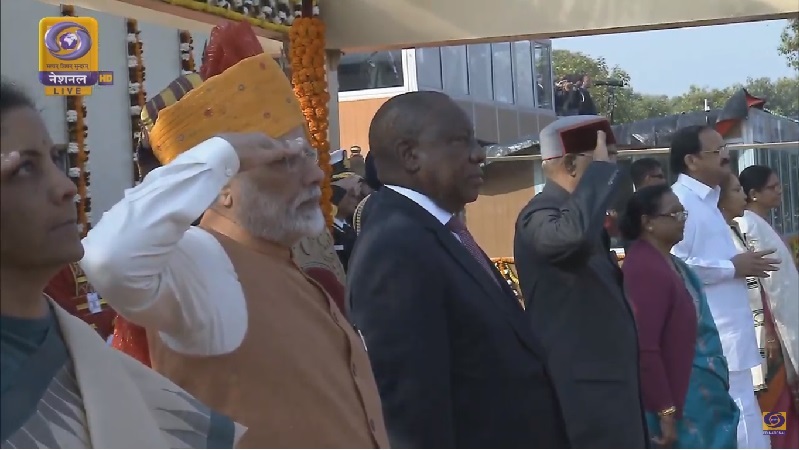 “Matamela Cyril Ramaphosa“, the fifth and current President of South Africa was the Chief Guest on 70th Republic Day of India 2019. Live coverage has been started at 9:30 AM. 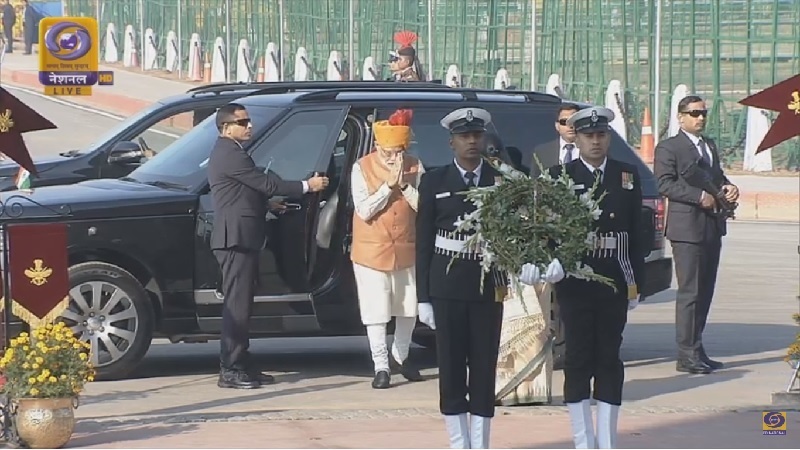 09:40 AM – Arrival of Prime Minister Narendra Modi at Amar Jawan Jyoti. 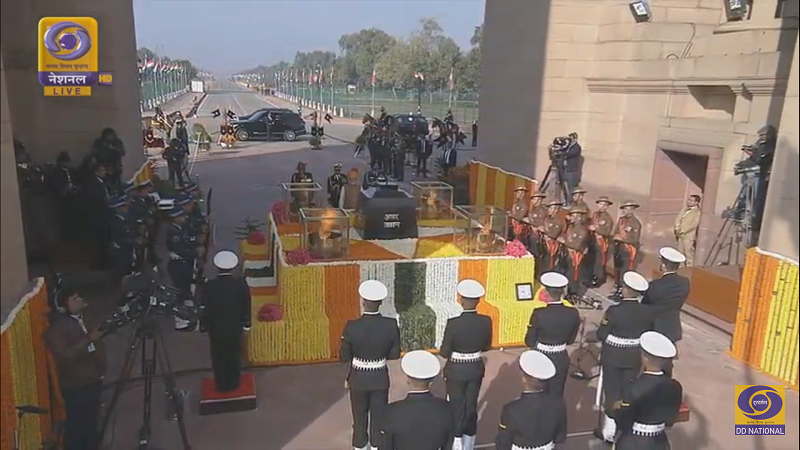 09:45 AM – Narendra Modi paid tribute to the brave soldiers at Amar Jawan Jyoti along with the three heads of Indian Armed Forces. 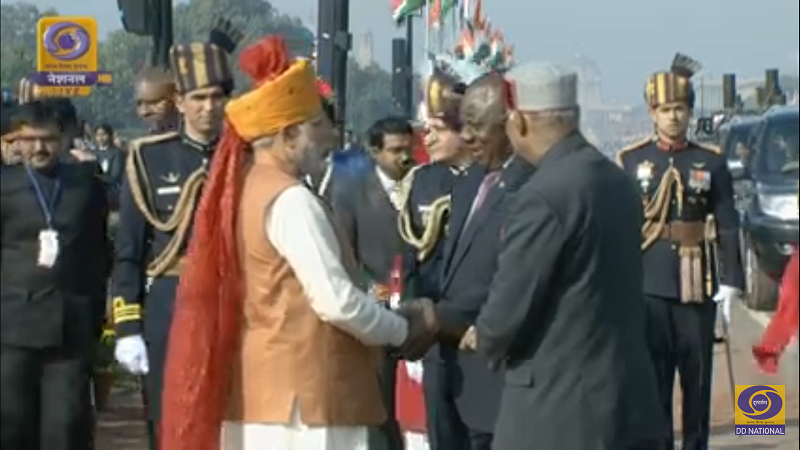 09:55 AM – The three heads of the Indian Armed Forces welcomed Prime Minister at the Rajpath. 09:56 AM – Arrival of Vice President of India, Sri Venkaiah Naidu at Rajpath. 09:57 AM –President of India, Sri Ram Nath Kovind arrived at Rajpath along with the Chief Guest (Cyril Ramaphosa) and His Wife. 10:00 AM – Flag hoisted by President of India at Rajpath. 10: 02 AM – Felicitation of Gallantry awards to the Brave soldiers. 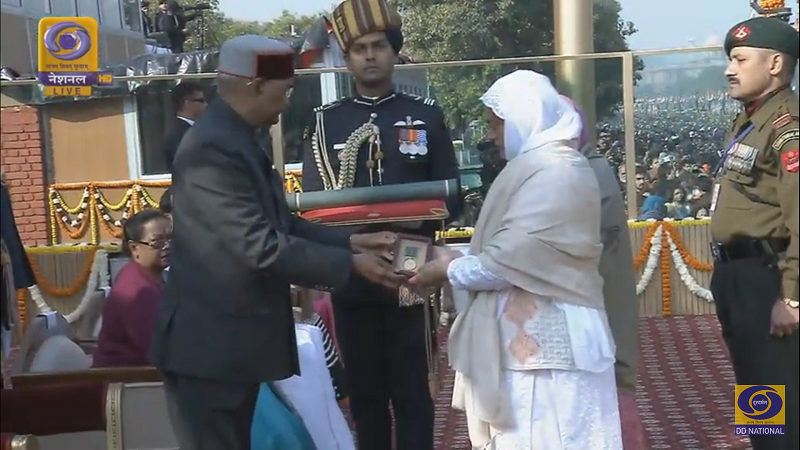 10: 04 AM – Ashok Chakra awarded to Nazir Wani’s Wife by the hands of President of India. 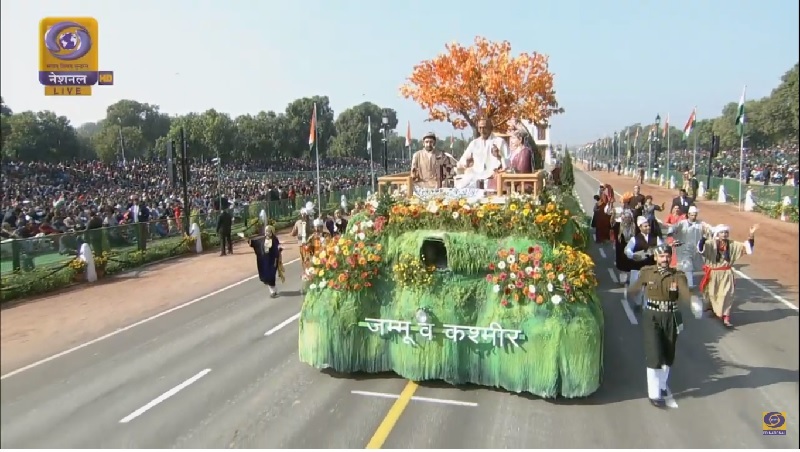 10:06 AM – Start of the 70th Republic Day Parade at Rajpath. 10:11 AM – President received the salute from the parade. 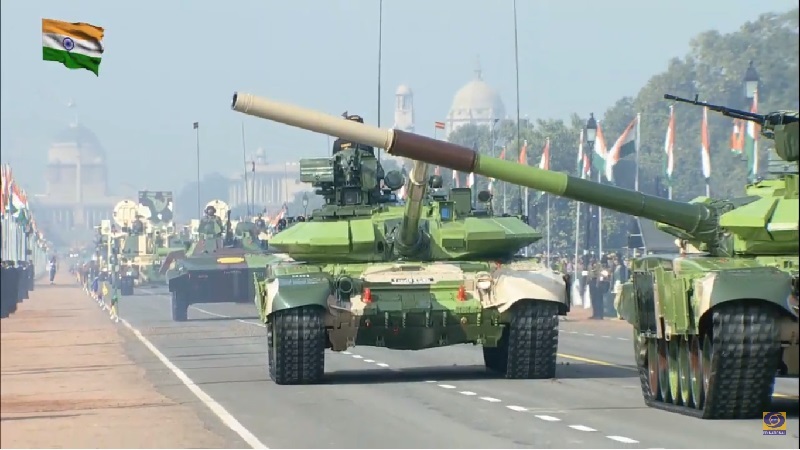 10:12 AM – Arrival of T-90 Bhishma Tank in the parade. 10:15 AM –Followed was the K9 Vajra at the Rajpath. 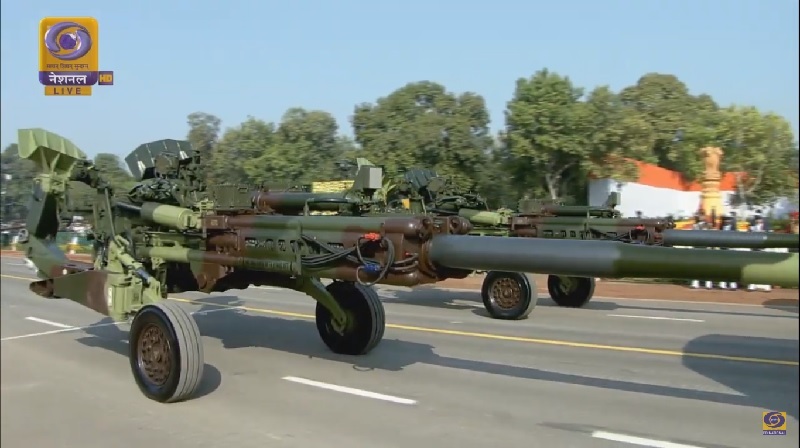 10:16 AM – M777 Howitzer arrived on Rajpath. 10:17 AM – March Past begun at Rajpath led by Prakash Singh Rathore. 10:20 AM – Arrival of Army Service Corps led by Bhawana Kasturi. 10:23 AM – Start of the March Past of the Indian Naval Forces led by Ambika Sudhakar. 10:25 AM –Tableau of Naval Forces arrived at Rajpath. 10:26 AM – Start of the March Past of the Indian Air Force. 10:26 AM –Tableau of Indian Air Forces showcased the Air Force capabilities of India at Rajpath. 10:33 AM – Arrival of Camel Mounted Contingent of BSF. The theme of the Republic Day 2019 celebration was ‘Gandhi’ as India celebrates his 150th birth anniversary in 2019. 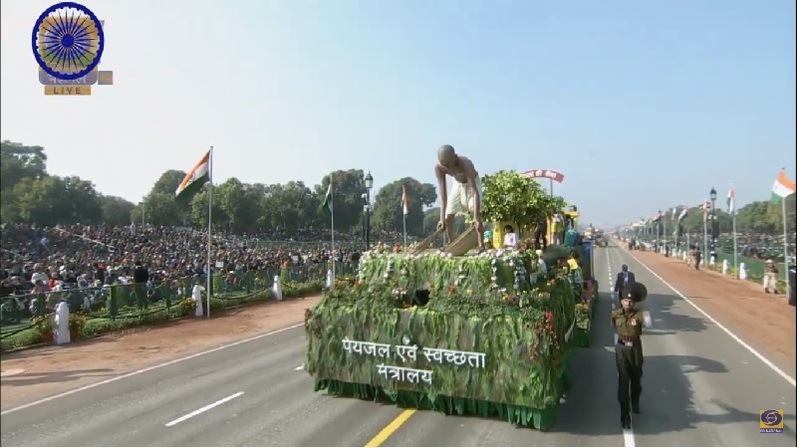 16 tableau from states and 6 from ministries took part in the parade based on theme ‘Gandhi’. President of India, Sri Ram Nath Kovind, in his address, commemorated the values of democracy and emphasized the strength of India’s diversity, democracy and development. The delegates of the Pravasi Bharatiya Divas 2019 also witnessed the grandeurs of the Republic Day celebration this year. M777 Howitzer and K9-Vajra-T guns were also showcased in the parade which were recently inducted in the Indian Army. 4 veteran soldiers of Netaji’s ‘Azad Hind Fauz’ also participated in the parade at Rajpath. It was first time in the history that an all women contingent of Assam Rifles took part in the parade. It was also the first time when an all men Army Services Corps was led by a woman officer, Lt. Bhawana Kasturi. 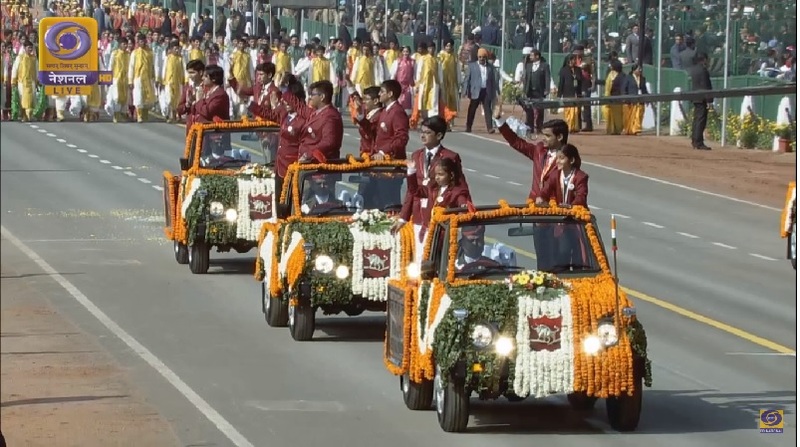 The winners of the National Bravery Awards did not took part in the parade due to the allegation of financial integrity to the NGOs giving these awards however Rashtriya Bal Puraskar winners participated in the parade. Declaration of various awards was also done on the eve of the Republic Day. Former President of India Mr. Pranab Mukherjee was awarded Bharat Ratna. Social activist Nanaji Deshmukh and famous singer Sri Bhupen Hazarika were also awarded Bharat Ratna, posthumously. Republic Day was also celebrated in all the states with great pride and patriotic fervour. Republic Day parade in Lucknow showcased T-90 Bhishm Tanks, Anti Tank Guided Missiles, Automatic Grenade Launchers etc. Like Independence Day is celebrated to enjoy the hard won freedom of India from the British Rule, Republic Day in India is celebrated to commemorate the coming of its own constitution into force. It is officially celebrated every year in the national capital of India (New Delhi) at Rajpath in the presence of the Indian President. Besides, celebrations in various other states also take place in the presence of their respective state governors by hoisting the National Flag of the country. January 26 is declared as the national holiday all over the country by the Government of India. It is celebrated throughout the country with great enthusiasm and show by the students and teachers in schools, colleges, universities and other educational institutions. An excellent parade and salute event is held by the military team at Rajpath in front of the India Gate in New Delhi, India. Events and celebrations are organized with great effort by the government of India in order to celebrate Republic Day in the Capital. A huge, grand military parade is held in New Delhi at Rajpath as well as the state capitals. Participants from the Indian Army, Air Force, Navy and traditional dance group takes part in the parade. 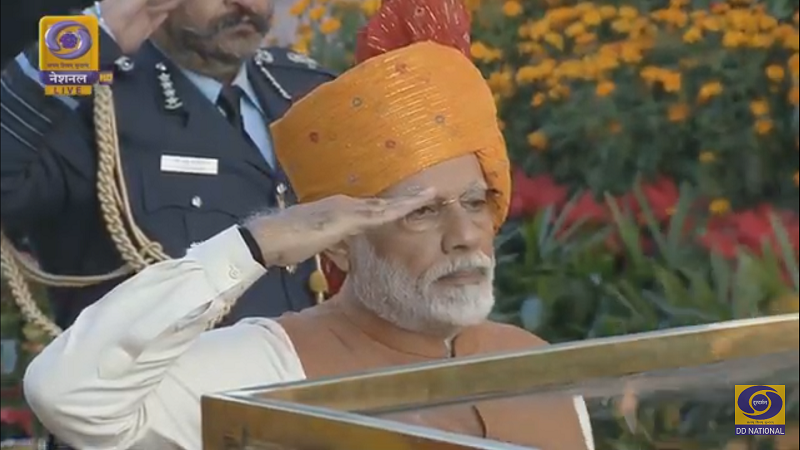 Parade held in New Delhi especially begins when prime minister of India pays tribute to the Amar Jawan Jyoti at India Gate. It is done to commemorate the sacrifices made by our Indian army soldiers while saving the country. 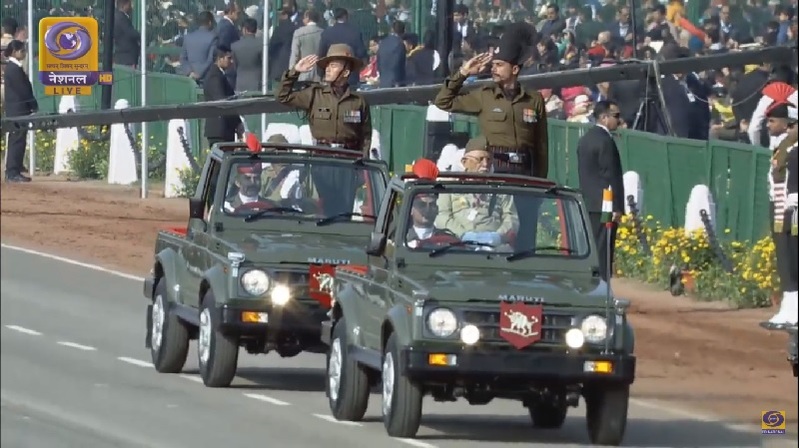 Military salute is taken by the President of India during the parade in the Capital whereas military salute is taken by the state governors in their respective state capitals. On this special day, one foreign head of the state is invited as the president’s chief guest. On this day, the soldiers of armed forces, common people and students from the school are honored with various national awards, such as Maha Veer Chakra, Ashok Chakra, Param Veer Chakra and Veer Chakra along with bravery medals for their exemplary work and performances. Most strikingly, the helicopters of our armed forces perform a show in the sky and shower rose petals over the audience sitting in India Gate. In addition, you can also enjoy various dance and singing performances by the school children. The staff of the armed forces performs rides through motorcycle whereas the staff from the Indian Air Force performs fly parade on the fighter planes (making tri color of the Indian Flag with the help of smoke) for offering the honor salute to our president. A range of traditional and cultural programs are performed by the professionals from different states to focus on the history and culture of our country. During this grand celebration, prime minister’s rally and Lok Tarang – National Folk Dance Festival is also held from 24th to 29th of January. 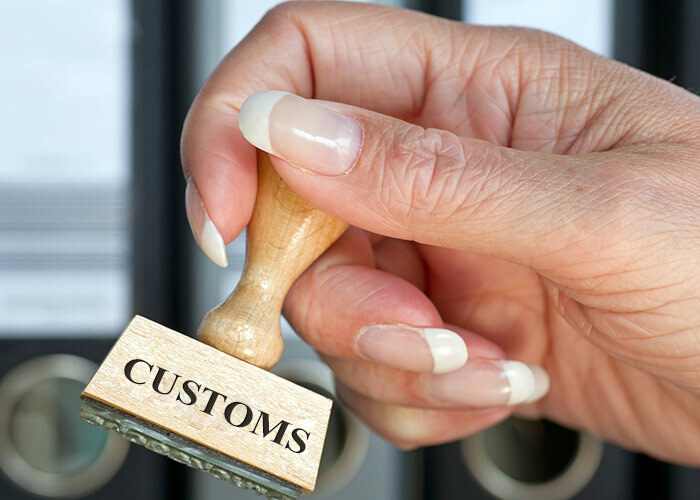 All the government and non government offices of the nation and state, including post offices and banks remain closed on this day. Special security is organized on this day because of a huge gathering and to prevent any mishap from happening. India got freedom from the British Rule on 15th August 1947. At that time, there was no permanent constitution of the country. It was on 4th November 1947 that the first draft of the Indian Constitution was presented by the drafting committee to the national assembly. The first draft of the Indian Constitution was signed by the national assembly in both versions, i.e. English and Hindi on 24th January 1950. Thereafter, the Constitution of India came into effect on Republic Day, i.e. 26th January 1950. Since then, 26th of January is being celebrated as the Republic Day in India. On this day, India was declared as the Purna Swaraj Country and thus we began celebrating this day as the anniversary of the Purna Swaraj Day. The Constitution of India empowered the Indian Citizens to select their own government. The oath was taken by Dr. Rajendra Prasad as the first president of India at Durbar Hall in the Government House. India has a big history behind celebrating the Republic day. Republic Day is the symbol of true spirit for the independent India where Indian President hoists our national flag and grand military parades, exhibiting the military equipment take place, including a variety of other events. Indian National Flag is tricolor in nature having horizontal stripes, i.e. upper saffron, middle white and bottom of dark green colour divided in equal proportions and a wheel (navy blue colour, having 24 spokes) in the centre representing the Sarnath Lion Capital of Ashoka. India is a country where people from different cultures, societies, religions and languages live in harmony with each other. The freedom of our country is indeed a matter of great pride because needless to say it was obtained after many years of struggle and great sacrifice. Therefore, this day is celebrated every year in order to make Indian people feel proud of having taken birth on this multi-cultural land. Republic Day is celebrated in a very colorful fashion in order to make celebrations memorable and special for every Indian Citizen. National Anthem is sung by the people who take part in the celebration. This celebration brings all the Indian people together and instills a feeling of national pride as well as love for our country. Prime Minister Narendra Modi arrived at Amar Jawan Jyoti in the bulletproof car guarded by SPG bodyguards. He was welcomed by Defence Minister of India, Nirmala Sitharaman and was accompanied by the three heads of the Armed Forces to lay down the wreath at the Amar Jawan Jyoti. 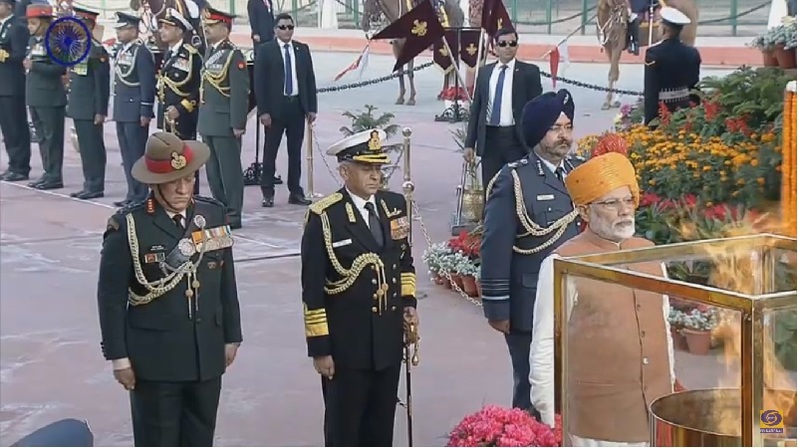 Prime Minister along with the Chief of the Army Staff, General Bipin Rawat, Chief of the Naval Staff, Admiral Sunil Lamba and Air Chief Marshal, Birender Singh Dhanoa paid tribute to the martyrs at the Amar Jawan Jyoti and observed a minute of silence. Hon’ble President of India Sri Ram Nath Kovind, Vice President Venkaiah Naidu, Prime Minister Narendra Modi, Hon’ble Chief Guest Cyril Ramaphosa, Defence Minister Nirmala Sitharaman and other dignitaries saluting the National Flag at Rajpath. The T-90 Bhishma tanks arrived at the Rajpath which is India’s main battle tank originally manufactured in Russia. The 46 tons can run at the speed of 60 km per hour. Following the T90 Bhishma was the arrival of a highly mobile Infantry Combat Vehicle which can destroy the target up to 4 kilometers in night time also. The vehicle is equipped with highly explosives ammunition and advanced weapon system. 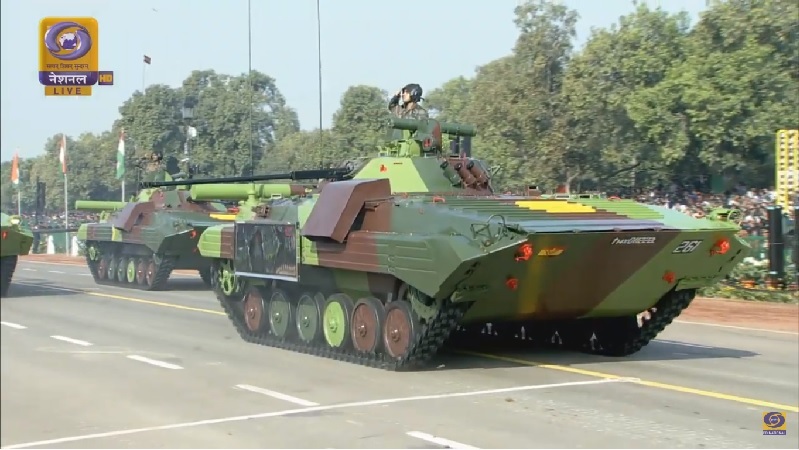 K9-Vajra T was displayed first time in the Republic Day Parade. This self propelled gun was recently inducted in the Indian Armed Forces. The K9 Vajra T has been manufactured by L & T under Narendra Modi’s ‘Make in India’ initiative at Armoured System Complex at Hazira, Gujarat. 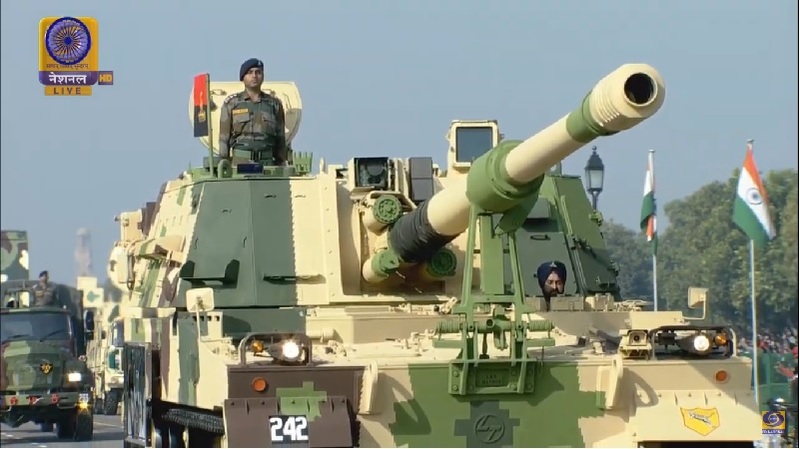 M777 A2 Ultra Light Howitzer was also showcased first time in the Republic Day parade and was inducted in the Armed Forces in November 2018. The gun has the range up to 30 km and provides a very reliable fire support in the battleground. It is highly mobile system with great reliability. The guns will be assembled in India by the BAE System with the collaboration of Mahindra Defence. 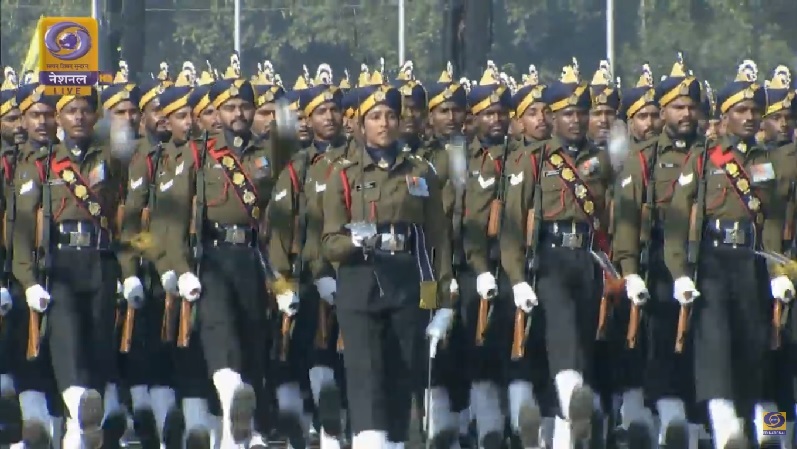 It was the first time in the history of Republic Day parade that an all men contingents of the Army Services Corps was led by a woman officer, Lt. Bhawana Kasturi. She led the contingent of 144 jawans in the parade at Rajpath first time ever in the parade. 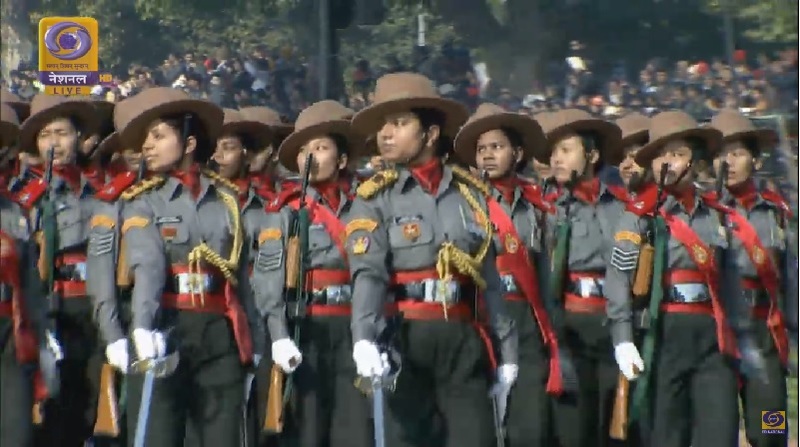 The all women contingent of Assam Rifles also created history by taking part in the Republic Day parade at Rajpath for the first time. The contingent of Assam Rifles which is considered as the oldest paramilitary force was led by Major Khushboo Kanwar. 4 veteran soldiers of the Netaji Subhas Chandra Bose’s ‘Azad Hind Fauz’ also participated in the parade for the first time. They were the soldiers who fought against the British forces during the Indian freedom struggle. Parmanand, Laltiram, Hira Singh and Bhaagmal all over the 90 years of age participated in the 2019 parade with great pride. The Ministry of Drinking Water and Sanitation based on the ‘Swachh Bharat Mission’ theme was highly applauded by the Prime Minister and the audiences. 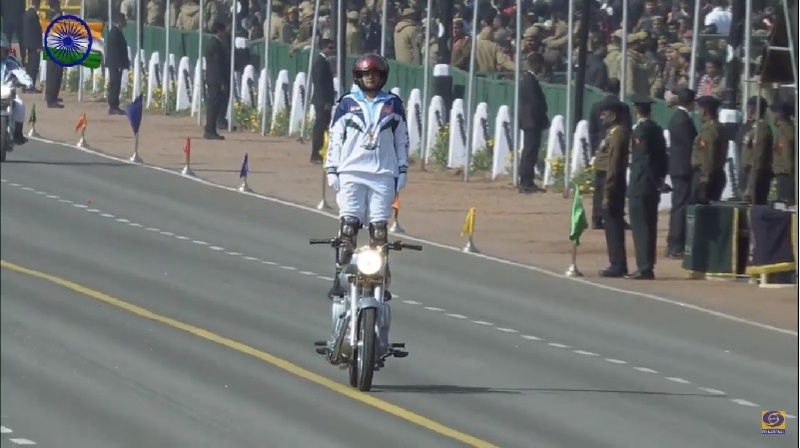 First stunt woman of the Indian Army, Captain Shikha Surabhi also showcased the breathtaking stunt in the parade. She led the Daredevil Motorcycle Display Team of the Indian forces which holds around 23 world records and one Guinness World Record. The children who won the bravery awards also participated in the parade with great pride and honour and setting an example for others. 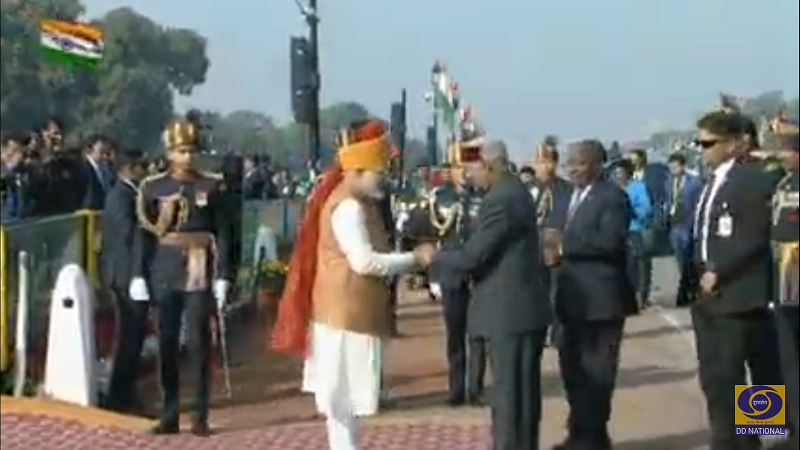 They greeted the dignitaries present at Rajpath with great honor and excitement. 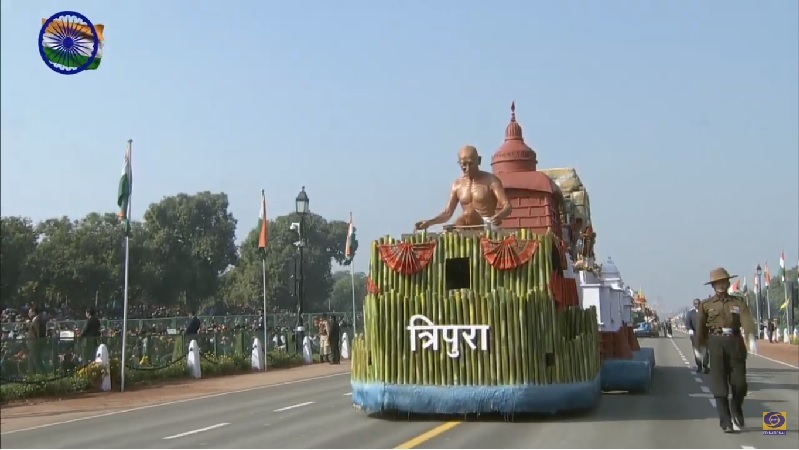 Tripura tableau was chosen as the best tableau in the Republic Day parade 2019 with the theme of “Empowering Rural Economy the Gandhian Way”. Jammu & Kashmir came second with the theme “Gandhi Ji- A ray of Hope- A Composite Culture”. The ‘Jalianwala Bagh Massacre’ depicted by Punjab tableau bagged the third position in the Republic Day parade 2019. The Beating the Retreat Ceremony is organized in Delhi, the capital city of India. As we know that the celebration of Republic day, i.e. 26th January, in Delhi kick starts with the multihued parade at Rajpath. But it’s not the parade that marks the end of this glorious day because the ceremony is brought to a closure with the ‘Beating the Retreat Ceremony’ that takes place on 29th of January. The venue for this ceremony is Vijay Chowk or the victory square, Delhi, having the majestic background of Rashtrapati Bhawan. When Beating Retreat Ceremony is celebrated? The Beating Retreat Ceremony is celebrated on 29th January in the capital city of Delhi. This ceremony is organized right after three days of the Republic Day celebration, i.e. on 26th January. The Beating Retreat Ceremony in Delhi officially marks the end of the Republic Day celebration. This festival of ‘Beating the Retreat Ceremony’ is observed every year in Delhi with a view to commemorate the age-old customs and tradition, which the soldiers brought to an end while approaching a war during the sunset. The sound of the bugles can be heard and its vibrations can be felt across the battleground and the fighting is called off. This ceremony is marked as the official culmination point of the Republic Day celebrations. The whole view looks so majestic when the definite units of our military forces perform live executions. After their live performance, a hymn is being played by the group bands, which are collectively known as “Abide with me”. On this day, during the evening the bugles are played in order to produce retreat sound and the National Flag is brought down with the singing of National Anthem in an absolutely musical harmony. There are silhouetted riders who recede into the background and with this the celebration is brought to a close.